Shortly before he died, Plenty Coups, the last great Chief of the Crow Nation, told his story--up to a certain point. "When the buffalo went away the hearts of my people fell to the ground," he said, "and they could not lift them up again. After this nothing happened." 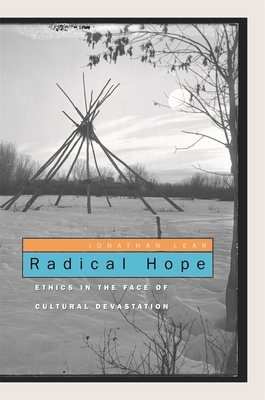 It is precisely this point--that of a people faced with the end of their way of life--that prompts the philosophical and ethical inquiry pursued in Radical Hope. In Jonathan Lear's view, Plenty Coups's story raises a profound ethical question that transcends his time and challenges us all: how should one face the possibility that one's culture might collapse? This is a vulnerability that affects us all--insofar as we are all inhabitants of a civilization, and civilizations are themselves vulnerable to historical forces. How should we live with this vulnerability? Can we make any sense of facing up to such a challenge courageously? Using the available anthropology and history of the Indian tribes during their confinement to reservations, and drawing on philosophy and psychoanalytic theory, Lear explores the story of the Crow Nation at an impasse as it bears upon these questions--and these questions as they bear upon our own place in the world. His book is a deeply revealing, and deeply moving, philosophical inquiry into a peculiar vulnerability that goes to the heart of the human condition.